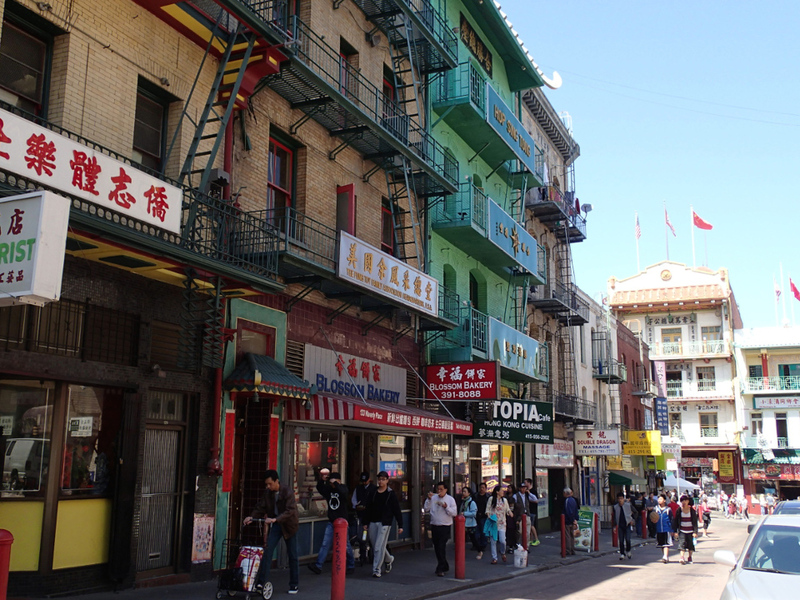 San Francisco has the largest Chinatown outside of Asia, and the oldest in North America. On Saturday morning I joined a City Guides walking tour through San Francisco’s Chinatown. 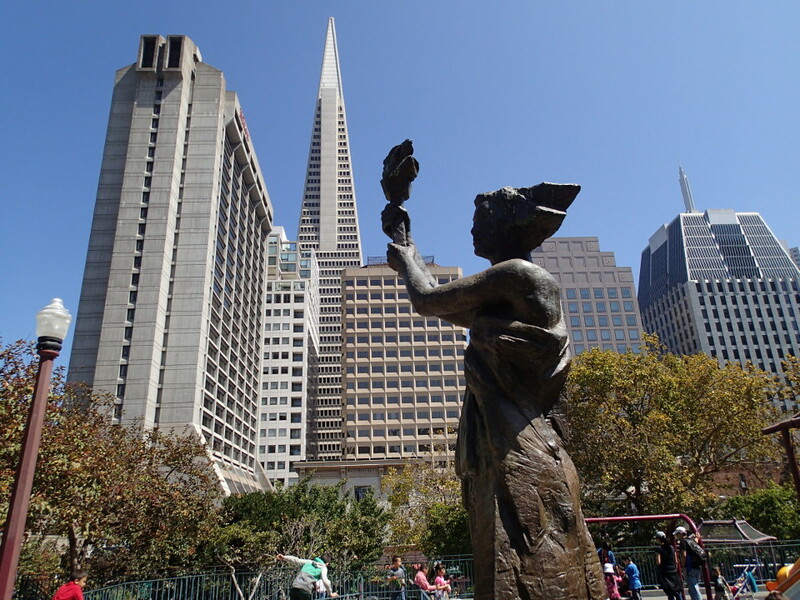 City Guides is a non-profit, primarily volunteer operation, and a partner of the San Francisco Parks Alliance. Most of their funding comes from donations from the tour participants as well as sponsorship from the City Library and some grants. Our guide, Mae Schoenig, grew up in Chinatown, so she was able to enrich the historical information with personal anecdotes. 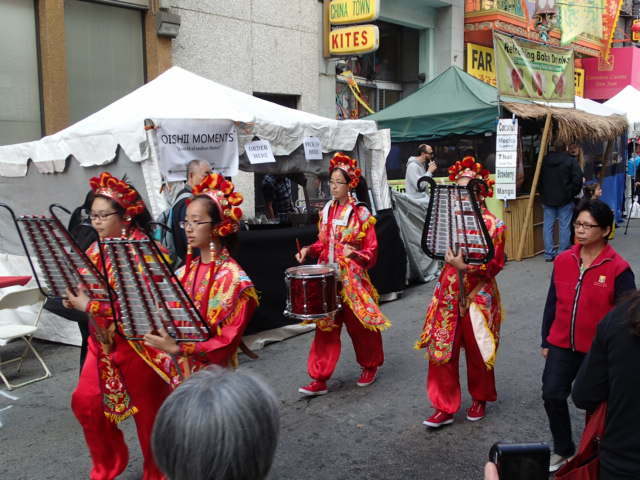 This week-end was the Autumn Moon Festival and Chinatown was even more animated than usual, with some streets closed to traffic, parades, entertainment and street booths selling everything from food to socks. We learned about the history of Chinatown, starting with the Gold Rush in 1849 when the Chinese first arrived, at a time when the water from the Bay came all the way to that neighbourhood (the streets east of Montgomery Street were built on filled land). An earthquake in 1906 caused a fire that destroyed a third of the city, including the whole of Chinatown. Hence the buildings one sees today are only about one hundred years old. The walk started in Portsmouth Square which, Mae explained, is where the locals congregate to chat, play games, and so on, sort of like Chinatown’s living room. A plaque indicates that it is also the spot where Commander John B. Montgomery of the ship U.S.S. Portsmouth first raised the American flag after taking the land from the Mexicans. A few metres away, the “Goddess of Democracy” is a statue symbolizing the ideals of human rights and democracy that the Chinese students protested and died for in Tiananmen Square in 1989. We continued past several murals painted on buildings, then walked a section of Grant Street (the main artery) where a couple of loud mini parades interrupted Mae’s talk. The second part of the walk was along Waverly, the longest “alley”, lined with ornate and colourful buildings housing various associations (many based on family names). Some of these buildings are boarding houses. To this day, it is not uncommon to find an entire family living in a SRO (single-room occupancy), basically a room designed for a single person with a single bed! Next we entered a pedestrian alley, home to the Golden Gate Fortune Cookie Factory. 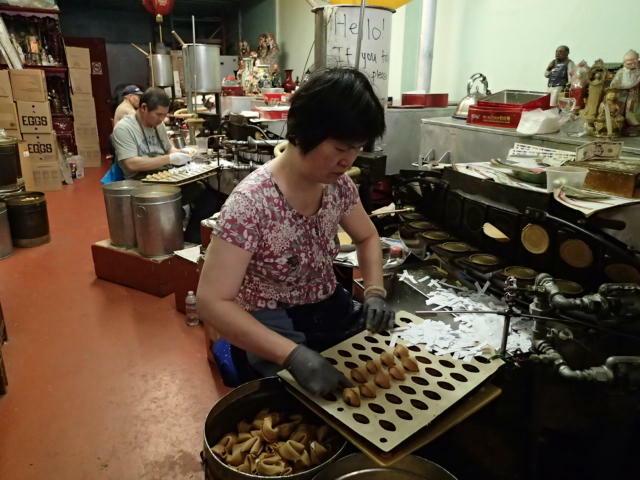 Well, factory is a bit of an overstatement for this narrow shop, but where else can you see fortune cookies being made? This place has become so popular with tourists that they ask 50 cents for the privilege of taking photos! Some people in our group didn’t know that fortune cookies are not Chinese; they are an American invention. Just outside, an old gentleman played us a tune on a traditional Chinese string instrument. Scenes from the movie “The pursuit of happiness” (with Will Smith) were filmed in this alley, and the old musician proudly told us that he had a cameo in this movie (in addition to a few other TV appearances). Of course he expected a donation. Chinatown is only five blocks wide by five blocks long, but many alleys between the official streets make it a true maze where residents can lead their lives away from prying eyes. Mae told us that as a child, she could take a different way to school every day! Some of the narrowest alleys have since been blocked off. With its stories of gangs, human trafficking, gambling and other illegal activities taking place over the years, Chinatown didn’t always have the best reputation, but this certainly hasn’t stopped the tourists from coming! I had planned all along to have lunch in a Chinese restaurant and as I was hoping, our guide had recommendations. In fact she had a whole printed list of them. I picked the Shanghai Bund restaurant because it was nearby, and I was getting hungry. I ordered the house noodles (“noodles with pork and scallions” said the menu). Unfortunately my meal was disappointing. I would go as far as saying it was some of the worst Chinese food I’ve ever had! I got a bowl of noodles with a few bits of pork and desiccated burn out scallions topped with soy sauce. On the other hand, the food of the two Chinese girls sitting next to me looked quite good. I have a couple of theories. I might have picked the wrong dish. Or they figured the “foreigner” wouldn’t know any better. Or it could just be that Chinese food culture doesn’t favour the solo traveller. I’m thinking that I may actually have better luck in a Chinese restaurant not located in touristy Chinatown.